At Girton Glebe, we believe that music has a vital role to play in children’s education. We are lucky to have a wide range of resources in the school as well as a range of opportunities to offer our pupils throughout the children’s primary career. We offer the children the opportunity to take weekly music lessons. These are arranged directly through Cambridgeshire Music who can be contacted on 01480 373 500 or at http://www.cambridgeshiremusic.org/ . Children thrive during their one to one or group sessions. Instruments currently taught include piano, brass, violin, guitar and percussion although a wider range of instrument tuition is available. We have a broad range of exciting music projects throughout the school. In 2017, the school is part of the SingFest project run by Cambridgeshire Music which featured our Year 4s singing at Cambridge Union, whilst our Year 5s and Year 6s have sung at the O2 as part of the Young Voices project. In Key Stage One, children have weekly music lessons which are based around the National Curriculum. They use their voices expressively, play tuned and untuned instruments and compose their own too. At Christmas, Key Stage One always put on an impressive musical productions and children in Reception stage a Nativity play with singing and dancing. In Year Three and Four, children have the opportunity to learn the recorder. Children who wish to continue playing can then join the orchestra. 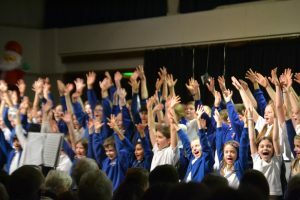 Across Key Stage Two, Music, which is embedded within cross-curricular projects, continues to be taught from the National Curriculum and include performing, appreciating a wide variety of music and composing. The Key Stage Two summer production stars year 6 and sees musical performances from every class. Recent productions have included Shakespeare Rocks! and The Pirates of the Curry Bean. During daily assembly, children use their voices expressively to sing a range of songs. We are currently enjoying learning lots of new assembly songs. 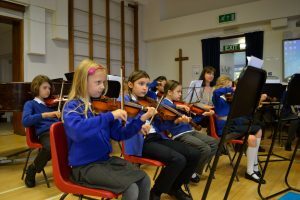 All children who play a musical instrument are invited to join the orchestra who perform throughout the year at Open Days, Assemblies and at our Orchestra and Instrumental Concert and the Girton Feast in the summer term. At Girton Glebe, we have a fabulous choir which every child in Years 4, 5 and 6 is encouraged to join. This year has been a busy one: they recently took part in the choir festival at the Cambridge Union where they performed extracts from Romeo and Juliet with other schools and with professional opera singers. 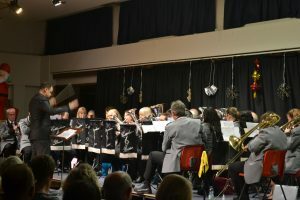 At Christmas, everyone enjoyed their collaboration with Cottenham Brass Band and Cottenham Juniors. 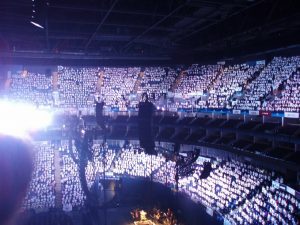 As part of the Young Voices project, our choir also perform at the O2 Arena along with thousands of other primary school children. This is a great opportunity for the children to perform in a world class musical venue.